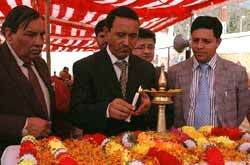 Jammu & Kashmir Current Events - Minister for Tourism and Culture, J&K Inaugurates Shiv Khori Festival. Jammu, February 22 – Minister for Tourism and Culture Mr. Nawang Rigzin Jora has said that the Government has formulated a comprehensive master-plan for development of Shiv Khori as a revered pilgrim-tourist destination, for which an amount of Rs. 12.50 crore has been approved. The Minister said this here today while inaugurating the Shiv Khori Mela at Base Camp, Ransoo, nearly 130 kilometres from Jammu. Thousands of devotees visited the holy cave at Shiv Khori shrine today on the first day of the mela. Deputy Commissioner, Reasi, Mr. Sanjeev Verma, who is also the Vice Chairman of Shiv Khori Shrine Board, Director, Tourism, Jammu, Mr. S. M. Sahni, General Manager, JKTDC, Mr. Shiv Kumar Gupta and other senior officers were also present on the occasion. Elaborating on the master-plan, Mr. Jora said that in Phase I of the project, Rs. 4.11 crore will be spent on the ongoing construction of five-storeyed waiting hall where 1,500 pilgrims would be accommodated, adding that once the complex is completed, it would house nearly 7,000 yatris. The three-day Mela is being organized by State Tourism Department, in collaboration with Shiv Khori Shrine Board. The holy shrine, located in the Shivalik hills,, is situated at an altitude of 4,000 ft. The Minister also said that Shiv Khori would also be incorporated in State Tourism festival calendar, adding that the Government would also initiate measures for setting up of craft centres in the area so that the local youth get benefited, thereby giving a fillip to the region's economy. Ransoo serves as base camp for reaching Shiv Khori which is three km away from the picturesque valley where the shrine is located. This is the third holy shrine revered by large number of pilgrims after Shri Amarnathji and Mata Vashno Devi shrines. It has gained popularity as a place of high religious importance and the pilgrim rush to the sanctum sanctorum has steadily increased to five to six lakh each year. Addressing the devotees, the Minister said the State has many pilgrim places where people from different parts of the country come and pay obeisance. He said the Government has devised a mechanism to promote pilgrim tourism in the State. Later, the Minister went around the mela and took stock of the arrangements made by the District Administration. He also met the yatris and interacted with them. The pilgrims appreciated the efforts of the Government in making the holy festival a success. In order to facilitate the visitors, various spiritual concerts, free-style wrestling and free langars have been set up by various social and non-governmental organizations. The Minister sanctioned Rs. 50,000 for organizing free wrestling competition during the festival. For installing street-lights at the base camp to provide proper illumination,more funds will be released shortly. The Minister also inspecting TRC, Ransoo where he was informed that Rs. 99 lakh would be utilized on remodelling and up-gradation of the Centre, which would be completed by June this year. Later the Minister also reviewed the working of Tourism Department in Officers' meeting and instructed them to work with machinery spirit and dedication and serve the public better. Elaborate arrangements have been made by the administration to facilitate the yatris during the Mela days.